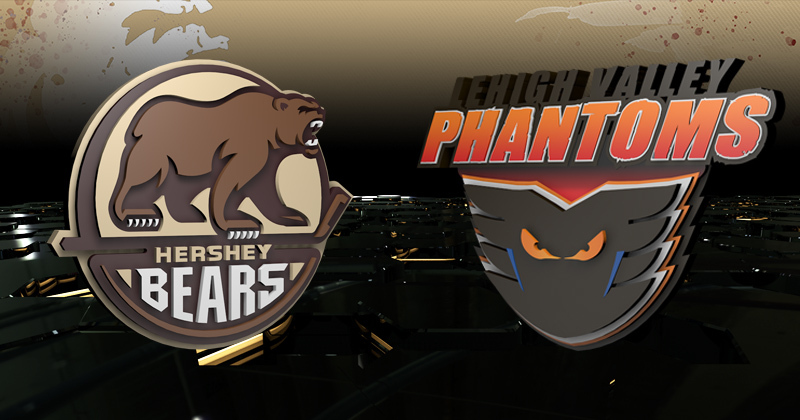 Game Preview: Bears at Phantoms, 7:05 p.m.
01/12/2019 - The Hershey Bears continue their three games in three nights stretch against the Lehigh Valley Phantoms. Tonight marks the front side of a home-and-home between the Bears and Phantoms. Both teams will rematch tomorrow at Giant Center. RADIO: WQIC-100.1 FM, Fox Sports 1460-AM, WOYK-1350 AM, Zack Fisch, the Voice of the Bears on the call. The Hershey Bears return to Pennsylvania after yielding four power play goals in a 6-2 loss to the Springfield Thunderbirds at the MassMutual Center. Mike Sgarbossa opened the scoring for the Chocolate and White only 3:30 into the game after burying a backdoor pass from Riley Barber on the man-advantage. The T-Birds responded with vengeance scoring five unanswered, including three times in the first period to grab a 3-1 advantage. Riley Stillman tied the score at 9:15 after being left open in the low-slot following a stop by Vitek Vanecek on a 2-on-1 rush. Anthony Greco earned his fifth goal of the season series at 11:23, and Matt Marcinew scored on the power play at 17:32. At 4:49 of the second period, Vanecek's night came to an end after Sebastian Repo scored on a wrist shot from the right face-off circle. Ilya Samsonov entered in relief to mark the first time this season a Bears starting goaltender did not reach the finish line. In the third period, trailing 5-1, Juuso Ikonen tallied his second goal of the season at 2:29, but Harry Zolnierczyk rounded out the scoring at 16:10. The Lehigh Valley Phantoms will also look to rebound after a loss, losing 2-1 to the Binghamton Devils last night on home ice. Zach Palmquist scored the lone goal for Lehigh Valley. Tonight marks the sixth of 12 games in the season series between the Bears and Phantoms. After winning the first meeting against Lehigh Valley this season on Oct. 28, the Bears have proceeded to lose the next four matchups. In the four game losing streak against the Orange and Black, the Bears have been out scored a grand total of 18-3. Riley Barber and Connor Hobbs are the only Hershey skaters to grab more than one point against the Phantoms in the season series. Barber has tallied two goals in four games against Lehigh Valley, and Hobbs has grabbed three assists in three games. On the opposite side, 15 different active Phantoms have two or more points against the Bears in the season series. Phantoms goaltender Alex Lyon has become a constant for his team in the past month. Lyon enters tonight after starting nine of Lehigh Valley's last 10 games. In that span, he has posted a 5-3-1 record with a 2.31 goals against average, .916 save percentage and one shutout. The lone shutout occurred against the Bears on Dec. 19 after turning aside all 18 shots in a 5-0 final. The Yale University product is currently in his third professional season and appeared in two games with the Philadelphia Flyers earlier in the 2018-19 campaign. With Sunday’s victory in Springfield, goaltender Alex Lyon passed Anthony Stolarz for the most wins in Lehigh Valley Phantoms history with 51. The Bears enter tonight's game with no goals on the power play against the Phantoms this season (0-for-13). On the flip side, Lehigh Valley has scored four of their 18 total goals against the Bears in the season series on the man-advantage (4-for-21). Greg Carey and Connor Bunnman both scored on the power play in Lehigh Valley's 5-0 win over Hershey on Dec. 19, and Carey and Mike Vecchione added power play tallies in a 6-2 win against the Bears on Nov. 23. Mike Sgarbossa's game opening goal last night marked his 16th tally of the 2018-19 campaign in 37 games. The early strike tied his goal total from last season with the Manitoba Moose in 68 games. Currently, Sgarbossa is only three goals away from tying his career-high (19), set in his rookie season with the Lake Erie Monsters during the 2012-13 season in 57 contests. The Campbellville, Ontario native leads the Chocolate and White with his 16 tallies, and has averaged a goal per every five shots this season. Riley Barber's assist on last night's opening goal has provided him points in six of his last seven games. During that span, Barber has sported four goals and six assists, along with two, three-point games. The consistent stretch has pushed Barber's point total to 29 (13 goals, 16 assists) in 31 games, which is within striking distance of a point per game production.